I’d like to introduce you to a warm, generous and very pleasant man – Robert Kissinger – owner of our very own Canyon Fireside Grille, located in the heart of Rancho Santa Margarita (across from Borders, next to Willow Manor). Over the years, Robert has owned and operated many restaurants in LA and OC. As it turns out, I used to visit his bistro in Brentwood quite often back in the early 90’s when I worked at the ad agency around the corner. I honestly feel that Robert has a gift as a restauranteur who has a genuine interest in our community. For example, he donated special treats to Wagon Wheel Elementary school’s jog-a-thon, was a sponsor at Trabuco Canyon Little League, and in February, he participated in the St. Baldrick’s Charity event at City Hall and afterwards, a slew of young boys from surrounding schools, who got their heads shaved in support of the event, came into “Canyon” with their parents to enjoy a home-cooked meal. With Robert’s gift and his wisdom from years of experience, he created a special place designed uniquely around our very exclusive Rancho Santa Margarita. For me, this beautiful area allows me to get in touch with my inner cowgirl — I love horses, the country, a great fire overlooking the raw beauty of our mustard-painted hills, and, of course, good “canyon cuisine” to go along with it all. Our journey began around sunset afte r a long week. When we arrived at ‘Canyon”, the fire pit was ablaze, and we were seated underneath the richly painted, (realistic mural of the) rugged landscape, and gazed out the window at the sun setting on the hills, nestled in the grand Saddleback mountain. 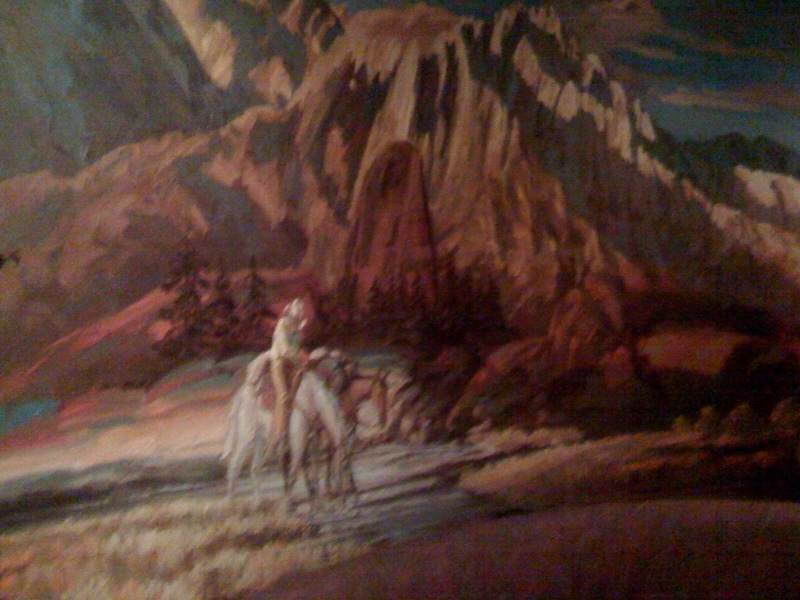 I love a good setting and “Canyon’s” interior set the tone for the evening. The only thing that was missing was my loyal dog, Buck. As the details of the day faded away, and we became more comfortable and relaxed, enjoying a colorful cocktail brought to us by a wonderful gal who has worked for Robert for years, the aroma from the grille became more apparent and enticing. 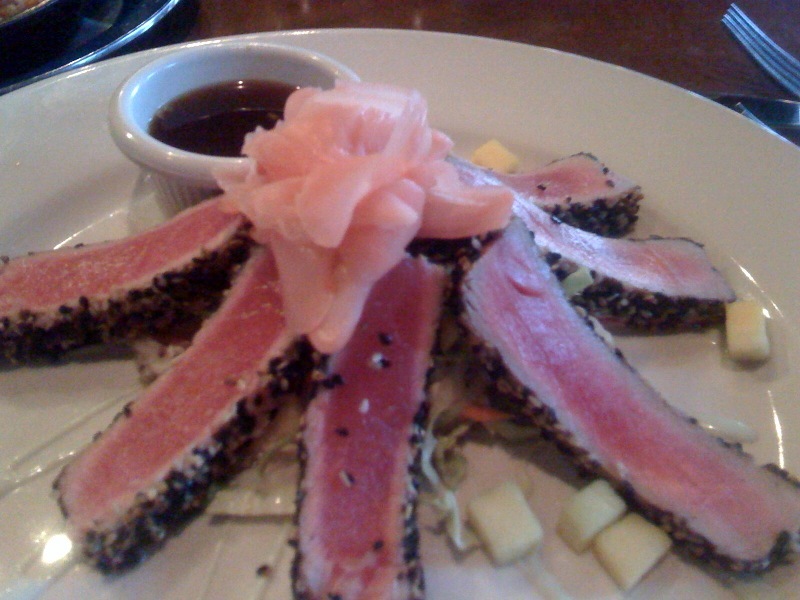 We started our meal off by sharing one of my personal favorites: Sesame Crusted Seared Ahi – Sesame and peppercorn crusted Ahi, served rare with wasabi cream, mango asian slaw, and thai dipping sauce ($13). 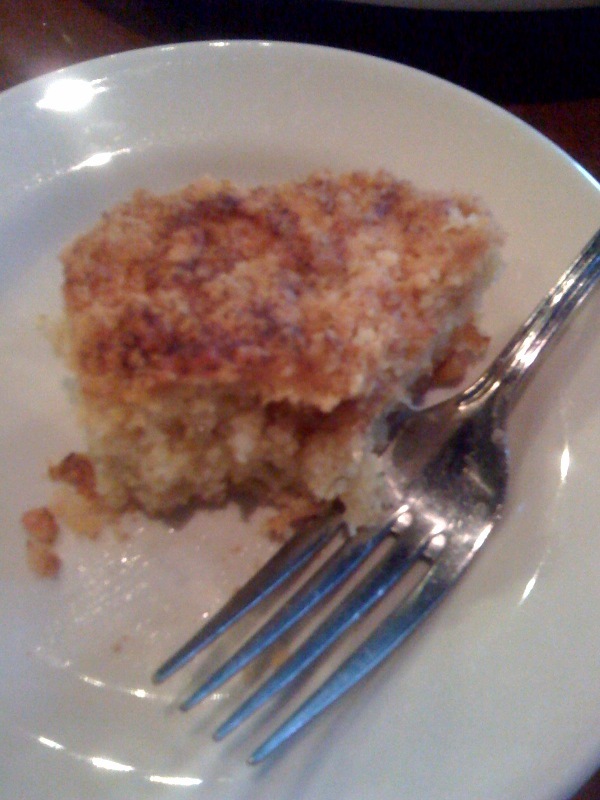 We also shared their amazing Corn Bread ($4) – when Cindy and I tried to figure out the ingredients, we became stumped and asked Robert what we were missing and he politely answered “Can’t tell you. Secrete recipe.” Trust me, we tried to get it out of him, but he just smiled. That corn bread can be dessert! At any good canyon fireside dinner, you have to have Herb-Crusted Rotisserie Chicken – Rotisserie roasted half chicken served over country gravy with their whipped potatoes and fresh fire-roasted vegetables ($15.95) – it was money! Next we shared, (are you ready for this?) Stuffed Halibut with Bleu Crab – Northern halibut stuffed with blue crab meat and artichokes with a beurre blanc sauce, whipped potatoes and fresh asparagus spears ($24.95) – you really must try it, absolutely amazing! 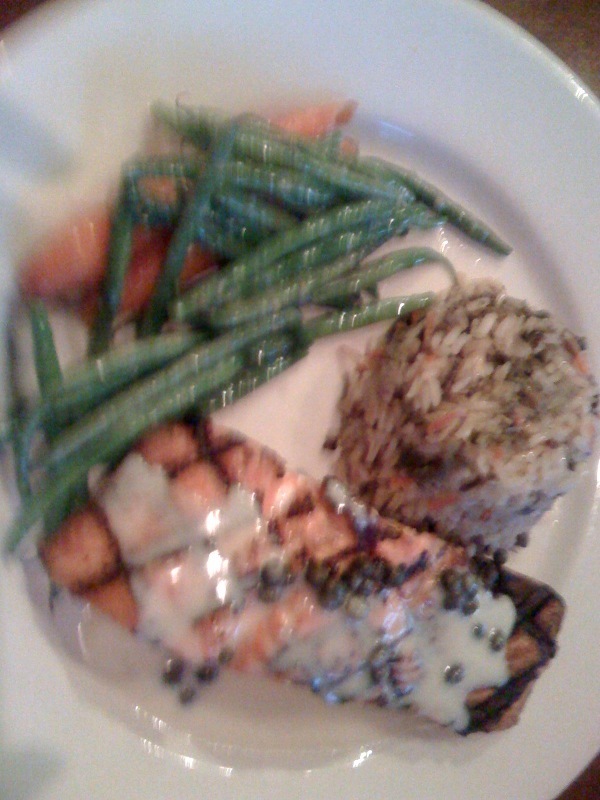 Then we ordered The California Zone – Grilled fresh Atlantic salmon fillet, prime flat iron steak, or chicken breast paired with fresh char-grilled seasonal vegetables and chilled tomato salad ($10.95) – we had the salmon and it was wonderful! To round out our meal, we all shared a famous Fireside Prime Flat Iron Steak Salad – Prime flat iron steak served atop mixed baby lettuces, oven-roasted tomatoes, crispy onion strings and balsamic-bleu cheese dressing ($16.95) – so great and satisfying. For dessert we dove into a Butterscotch Crème Brulee – need I say more? And please don’t tell my Turbo kick boxing workout instructor, Monica! Because we ate early – sunset in the spring is around 7:00pm, we were tired, full and just went home to “hit the hay”, we missed out on the live entertainment at 9:00pm! “Canyon” has live music and dancing in their bar section – Thursday evenings beginning at 7:30pm, and Friday and Saturdays beginning at 9:00pm. . I hear it’s thee place to go! Check out their web site for a list of the scheduled entertainers, menu items, etc. – www.canyonfiresidegrille.com AND you can “friend” them on Facebook! I love it! To add to the experience, Robert installed a cool, safari-like tent in which a larger party of 8 can sit at a round table and enjoy catching up with each other. It’s a fun little intimate experience with the flavor of the great outdoors – Coto style, of course. This summer, I look forward to going back and sitting outside on their patio and experiencing a “Canyon” warm, summer night. My Bunco group is actually scheduled to go there soon, and yes, we’re going to play! Oh, and try their breakfast on a leisurely Sunday morning, served from 9:30-1:00. Freshly brewed coffee and the smells of a “Canyon” breakfast, fireside – ahhhhhh…it doesn’t get much better than that. I can smell the aroma already. Robert is quoted saying, “We are a neighborhood restaurant. Our goal is to be on a first name basis with each guest. 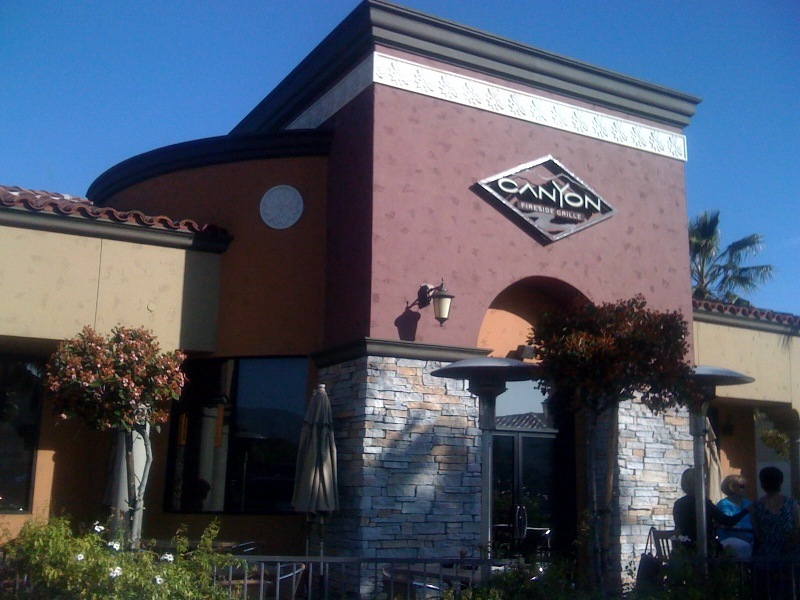 I look forward to seeing you at your next visit.” So, next time you go into Canyon Fireside Grille, ask for Robert and introduce yourself, relax and enjoy!